The difference between remembering that I LIVE in London and that I live IN LONDON. I’ve been back from Madrid for a couple weeks now, and have fallen back into the daily routine of work and home life. I was quite tired on returning from Madrid, and the scramble of catching up with what I had missed on my week away from work along with the nightly sessions organising my photos and writing up my five blog entries on my trip kept me busy. This week has been more of the same - catching up on TV programmes missed while I was away (Flashforward and the new series of Top Gear mostly), doing planning for upcoming Christmas shin-digs and dinner parties, doing laundry, shopping for new shoes after my fall in Sintra along with the constant buzz of work. All in all, it is a lot like life. In this daily rush of life, it is often easy to forget where I am. I don’t mean that in any sort of amnesiac sort of way. I am not walking around wondering to myself where I am, how I got here, what my name is and why I am covered in the blood of another man. (That would make a good opening for a short story or novel - anyone want to run with that?). Rather, I mean that life gets you wrapped up so much in its minutiae that you miss the bigger picture. I get so focused on LIVING in London that I forget I am living IN LONDON. Every once in a while though, I get pulled out of the fog of daily life to remember what I am living in another country and actually quite giddy about that. A recent event was last weekend. 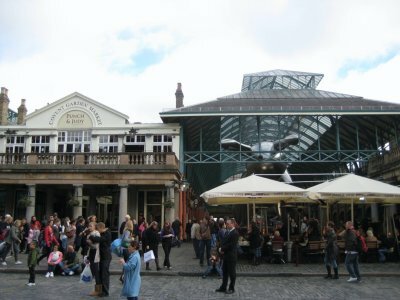 On my search for new shoes, I went down with my flatmate to the area around Covent Garden, where there is a number of outdoor shops all within a two block radius. The outdoor shop district, if you will. Much like the hammock district in Cypress Creek from the Simpsons. After shopping for shoes (unsuccessfully, unfortunately) and grabbing a coffee, we started the long march home. It was just after four in the afternoon, which sadly now means darkness has fallen, and we were walking up Bow Street when I looked up. There, lit in a beautiful set of lights, was the Royal Opera House. All pretty and white and Greek revival with its columns. Just seeing it suddenly snapped me out of the detail induced fog surrounding shoe styles and threw me up to the 50,000 foot level. “I live IN LONDON,” I suddenly thought to myself, and smiled. I, like most of us, I think, spend a lot of time walking around absorbed in my own thoughts. Work deadlines, emails that need to be sent, tomorrow’s Outlook calendar, the shopping list and tonight’s TV schedule are most likely to be found bouncing around in there. Sometimes all it takes to break the spell is to look up and see something you weren’t expecting. Sometimes, like last Saturday, it occurs as a happenstance. On Friday of this week, I will have been in the UK for a year and a half. 18 months abroad, and London will surpass Ottawa in the “places I have lived the longest” list - now fourth behind Burlington, Ontario, Canada; Toronto, Ontario, Canada and - strangely, perhaps - London, Ontario, Canada, where I went to university. As I approach that anniversary, I like to remind myself of that fact, and force myself to look up. On Tuesday, after a day down at my office in Surrey, I came back on the train. 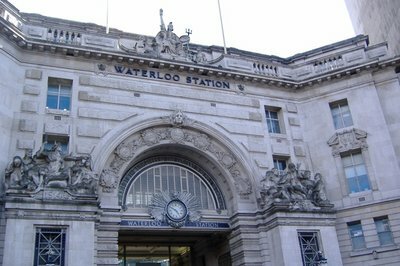 We pulled into a crowded and noisy Waterloo Station, where it took a good five minutes to shuffle along with the crowd off the platform and through the ticket barriers. Work was rattling around in my head, so I decided to get outside for some fresh air and a reminder of where I am. 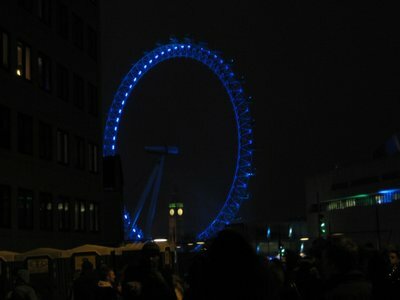 I started my hour long walk home from Waterloo by crossing the Waterloo Bridge, my iPod on shuffle in my ears. About halfway across, the last song ended and the iPod choose its next record. The Theme from Dr. No, aka the James Bond Theme came on. I smiled to myself. Super spies in London, and here I was crossing the Waterloo Bridge, where one of the most James-Bond-like things to ever happen in real life took place, when in 1978, Bulgarian dissident Georgi Markov was stabbed by a passerby with a poisoned umbrella while walking across Waterloo Bridge. Just then, an Aston Martin DBS slunk by across the bridge, the car that James Bond himself drove in Casino Royale and Quatum of Solace. Walking across Waterloo Bridge, the Parliament buildings and the London Eye in the background, with the James Bond Theme playing in my ears and perhaps even Mr. Bond himself driving by. Yup, I’m living IN LONDON alright.